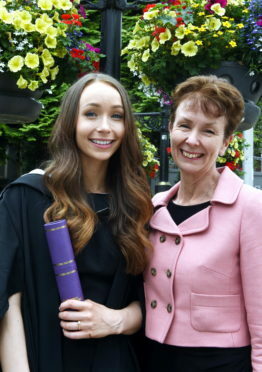 Ava Sim received her postgraduate diploma in human resource management at His Majesty’s Theatre in Aberdeen yesterday. She undertook the two-year course via a distance learning scheme, while busy bringing up her young family and working as a project manager with the NB Communications firm in Lerwick. The 26-year-old flew to Aberdeen only for exams, and is now looking forward to being able to spend more time with four-year-old Leo and two-year-old Darci. The new graduate is “keeping her options open” when it comes to where her degree might take her next. She previously completed an undergraduate business management degree at RGU by commuting from Shetland, while pregnant with Darci and occasionally bringing little Leo to tutorials. Despite the hectic schedule, Ms Sim still found time to play for the university’s netball team as well.